2018 Tour de France Cycling Holiday - Ride from Nice to Alpe d'Huez and watch the final mountain stages in the French Alps! Ride provence, climb Mont Ventoux, Ventoux to Alpe d'Huez, Cycle Tour French Alps, Cycle Tour French Riviera, Cycle Tour French Alps, Tour de France Holiday - Col de la Bonette, Izoard, Galibier. See the Tour de France on Alpe d'Huez and a Stage Start the next day in Bourg d'Oisans. 4 nights are based around Alpe d'Huez and Bourg d'Oisans enabling you some exceptional loop riding in the French Alps. We have a beautiful private chalet near Alpe d'Huez to enable you to watch Stage 12 & 13 of the 2018 Tour de France. $5170 AUD per person twin share; $400 single supplement. See our full detail of 2018 Tour Inclusions. Mont Ventoux, Col de la Bonette, Col du Vars, Col d’Izoard, Col du Galibier, Col du Lautaret, Col du Telegraph, Alpe d’Huez, Col de la Croix de Fer. Rolling hills in the first week to challenging and mountainous in the second week. Arrive with a good level of fitness with some climbing/hill training. OUR RIDE BEGINS IN NICE, EASILY ACCESSIBLE WITH MAJOR AIR AND RAIL LINKS THROUGHOUT EUROPE AND THE WORLD. WE STAY IN A FANTASTICALLY LOCATED HOTEL NEAR THE PROMENADE DES ANGLAIS AND OLD TOWN. We meet in Nice on Friday 6 July. Nice is easily accessible with direct flights from Australia. Hotel check-in is usually from 2pm onwards. We have pre-dinner welcome drinks in the evening at a bar near our hotel. We ride out of Nice along the coast and climb into the hinterland of the Cote d’Azur. We have spectacular views of the Mediterranean and ride past medieval villages - home to artists, galleries and markets. There’s an optional climb of the Col du Vence (963m), a local’s favorite, before arriving at our overnight stop in the picturesque Tourettes sur Loup for a welcome group evening meal at a great local restaurant. Check out more photos from our previous Nice to Alpe d’Huez Cycling Tours on our Photo Gallery. We cycle via the Gorges du Loup to the village of Gourdon, spectacularly perched on a rocky cliff above the gorge. From here we cross the remote alpine Plateau de Caussols, climb the Col de Bleine and descend to arrive in our overnight stop of Castellane, a vibrant town in the Verdon river valley. Today’s ride is a trip highlight - the spectacular sweeping road overlooking the Gorge du Verdon. The terrain is hilly as we climb to Point "Sublime" offering fine views of the gorge and emerald coloured river. We stop in medieval Moustieres Sainte Marie and ride through the biggest lavender field in France to arrive at Manosque for our overnight stop and hotel night. Today is quintessential rural Provence - golden hued perched villages, small scale vineyards, rolling countryside, lavender fields, markets, wild herbs and hidden valleys – and what better way to explore it than by bike! Our route takes us to three of the 144 officially rated 'most beautiful villages of France' and there is no shortage of touristic highlights. We will eat fresh local produce at Bistrot de Pays, drink the local wines and cycle the quiet back roads. Our overnight stop is Gordes, a stunning village overlooking the Luberon valley. There’s plenty to explore in and around Gordes, or perhaps put your feet up and relax by the campground pool! Today we climb the Giant of Provence, Mont Ventoux! Rising from the Rhone valley below, the 22km climb has an infamous history in the Tour de France. We climb from the traditional Bedoin side, however there’s options to tackle another ascent if you prefer. From the summit, it’s a fantastic descent to quintessential Provencal village of Sault, our overnight stop at the foot of Ventoux. It’s rolling countryside swathed in lavender, olive trees and vines as we approach the Alps. There are market-villages and options for more or less climbing as we weave our way along gorges and rivers. Options today include long-lunches, extra climbs, a shortcut or you can climb Mont Ventoux a second time in the morning before departing Sault! Campsite breakfast: fresh croissants daily! Today we ride along the Ubaye river valley, surrounded by snow-capped peaks of the Alps! You have the option to ride the epic Col de la Bonette (2802m), claiming the highest sealed through road in Europe. The views from the Col are spectacular, extending across the Alps and to the Mediterranean. We descend to the mountain village of Jausiers for our overnight stop. We begin to see hearty mountain food on menus including fondue and raclette. Today is a mountain climbers dream and one of the most challenging days of the trip! We ride the beautiful Col du Vars (2180m) followed by the epic Hors Categorie climb, the Col d’Izoard (2361m). The Col d'Izoard is famous for its forbidding and barren scree slopes and jutting rock pinnacles, known as the Casse Deserte, that has formed a dramatic backdrop for key moments in the Tour de France! The descent is spectacular, sweeping and fast, to arrive at the town of Briancon, a UNESCO World Heritage site. Today is another highlight day of spectacular mountain scenery and climbing. We depart Briancon to ride to the Col du Lauteret, a gradual 28km climb. We continue over the 8.5km winding road to the Col du Galibier (2642m), one of the most dramatic high alpine passes in the Alps. We descend to Valloire and it's a last up and over the Col du Telegraph to our overnight stop in the Maurienne valley. Optional climb of the Lacets de Montvernier for those after a few more hairpins! Our last day on the move is an epic ride, climbing over 3000m in altitude. In the morning we ride the famous Col de la Croix de Fer, descending to the cyclists mecca of Bourg d'Oisans. We then set off to conquer the 21 hairpin bends of Alpe d'Huez! we stay in the heart of the french alps in a private luxury chalet for 3 nights, enabling yo to watch stages 12 and 13 of the 2018 tour de france. our chalet has spectacular views of the alps, great access to alpe d'huez & bourg d'oisans to get up close & personal with the tour riders, team cars & atmosphere. We spend 3 nights in two adjoining, private luxury chalets in the quiet alpine village of Vaujany, located near Bourg d’Oisans & perched on a beautifully scenic slope in the corner of the Alpe d’Huez ski-resort area. Our chalets are fully equipped - bedrooms with en-suites, living & dining rooms to relax, bike garage, garden and balconies with spectacular views of the Alps. Vaujany connects to Alpe d’Huez via cable car (that you can take your bikes on!) and offers a truly special mountain village experience with some great traditional restaurants & other amenities. We’ve been visiting Vaujany for over 10 years and are looking forward to sharing with you this special place in the French Alps. Day 12 we ride from Alpe d'Huez to our private luxury Chlaet in the beautiful mountain village of Vaujany. There are numerous route options, including some lesser known, but no less spectacular climbs, including the Col de Sarenne and along stunning balcony roads over looking the Oisans valley. We'll take you to our favourite mountain restaurant with panoramic views of the Alps. For those after a rest day - you can transfer to our chalet via cable car. STAGE 12 TO ALPE D’HUEZ WILL BE 175KM OF PURE DRAMA. A CLASSIC STAGE WITH 3 HORS CATEGORIE CLIMBS. WE WILL CHEER THE RIDERS FROM THE BEST POSITION ON ALPE D’HUEZ – THE FINAL MOUNTAIN CLIMB & ENJOY THE ACTION & ATMOSPHERE OF THE TOUR – IT’S AN UNFOGETTABLE EXPERIENCE! Our final night is Friday 20th July and on Saturday 21st of July you need to organise your own onward travel arrangements from the Alps. Our final Chalet is located in Vaujany & we will assist with transport to Grenoble (via a fantastic Alpine bus service from Vaujany that carries bicycles). Grenoble has a train station with rail links to Lyon or Paris for TGV (very fast train) and international airports with flights to Australia. If you want to stay a night in Grenoble, we can recommend a conveniently located hotel near the bus and train station. 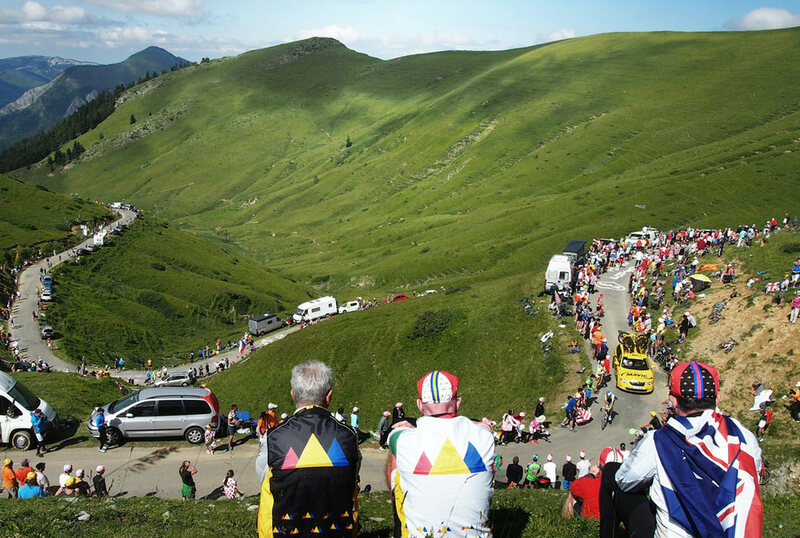 Each day we get to watch a stage of the Tour de France, we provide you with various options for viewing the Tour including loop rides and additional climbs located in and around Alpe d'Huez. Loop Rides are optional - you can relax around our hotel/chalet, visit the nearby towns and villages or those with weary legs can have a day to relax - after all, it is a holiday!